Hawaiian Spirulina, also known as blue green algae, draws nourishment from the world’s cleanest, deepest ocean. 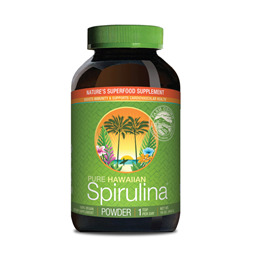 Hawaiian Spirulina helps support cardiovascular, eye and brain health, boosts immunity and energy. Now available as a Multi-Vitamin for a healthier lifestyle and general health support. New packaging: Fiberstone labels are a line of tree-free, water-free, low-carbon-footprint paper. It is recommended we eat five servings of fruit and vegetables per day. In real life, it doesn`t always happen. That’s why we recommend supplementing your diet with Spirulina, also known as Blue Green Algae. Hawaiian grown Spirulina Pacifica supplies more concentrated nutrition than any other whole food on the planet. The Nutrex facility uses ocean water drawn from a pipeline that plunges 2000 feet into the sea. Astoundingly, the water drawn using this pipeline has been below the surface since Old Testament times. Deep water from the Pacific makes a very slow migration, which starts at the poles. This deep water stays in a distinct layer, traveling like a very slowly moving river toward the tropics. The Nutrex system brings this ultra-pure, mineral rich water to their ponds. Nutrex then supplement their Spirulina systems with this deep water – providing a rich source of calcium, magnesium and all the essential trace elements. No other Spirulina is grown with such a rich source of naturally occurring nutrients. Take 1 teaspoon (3g) daily with or between meals. Enjoy mixed in juice, fruit smoothies, or sprinkled on food. Refrigerate after opening to maximise freshness. Below are reviews of Nutrex Pure Hawaiian Spirulina Pacifica - 454g Powder by bodykind customers. If you have tried this product we'd love to hear what you think so please leave a review. Like other reviewers, I did quite a lot of research online before deciding on this brand of spirulina. I am confident that it is of the highest quality and that it is safe. I use it daily and sense its benefits. Great for your body and Anthony Williams recommend this and I do too! Having done a fair bit of research into the best company to buy Spirulina from I came to conclusion that Nutrex manufacture one of the best quality products on the market. I have been using this Spirulina for the past few months and have noticed a definite improvement in my health apart from it being a rather acquired taste at first, although eventually I think I became accustomed to feeling great after consuming the Spirulina and my taste for it improved. This rich green pigmented powder is presented in a dark amber jar with a moisture absorber to improve shelf life and the packaging is great. I can't really recommend this Spirulina enough I have tried a few others over the years and nothing has come close. Pair it with a high quality Chlorella and you have a powerful combination of nutrient dense Algae's. Thank you bodykind for providing such a good service! Best Spirulina on the market. 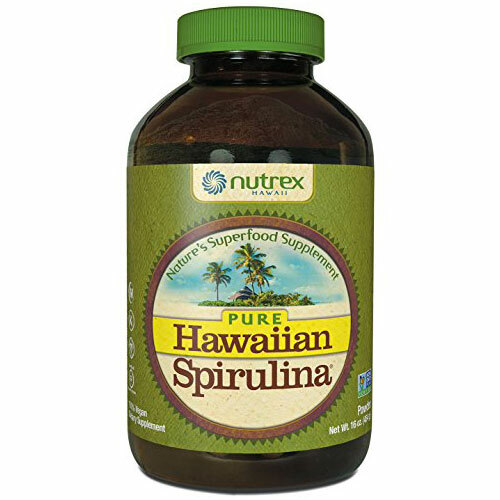 I had previously bought Organic Spirulina from a Health Food store, when I asked what was the best one to buy I was advised to buy Pure Spirulina, doing my research lead me to find Nutrex Pure Hawaiian Spirulina, I wanted to buy 500g and found that it was so expensive and I could not afford so much. I happened to come across Bodykind's website which had the amazing price and the amount which I wanted. The customer service was great and the customer services adviser was informative and answered all the questions I asked, I was very happy. After speaking to her I ordered my Nutrex Pure Hawaiian Spirulina and received it within 2-3 days. I have been using it for 3 days now and it is a great product, so much better than the Organic Spirulina I was buying, I am extremely happy with it. Just one thing to add, its ok to buy organic Spirulina but be careful with the one you buy as they could contain metals which are harmful as it is grown in a controlled environment unlike Pure Spirulina which is harvested in natural waters. I recommend that you Nutrex Pure Hawaiian Spirulina from Bodykind as they are a really good company and honest. Amazing! Gives me so much energy! Down side it tastes really bad!! So going to get tablets next time! 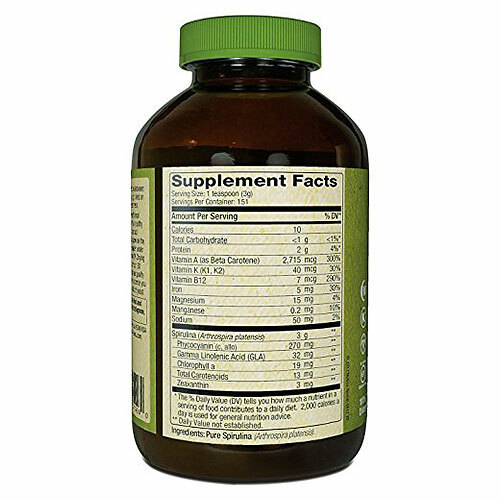 Question about Nutrex Pure Hawaiian Spirulina Pacifica - 454g Powder What is the difference between the Spirulina Tablets offered by Lifestream and those offered by Hawaiian Spirulina? Question about Nutrex Pure Hawaiian Spirulina Pacifica - 454g Powder What is the difference between Spirulina and Blue Green Algae? Question about Nutrex Pure Hawaiian Spirulina Pacifica - 454g Powder Is Hawaiian Spirulina superior to other spirulina? Question about Nutrex Pure Hawaiian Spirulina Pacifica - 454g Powder How should I take this? Question about Nutrex Pure Hawaiian Spirulina Pacifica - 142g Powder What is the difference between the Spirulina Tablets offered by Lifestream and those offered by Hawaiian Spirulina? Question about Nutrex Pure Hawaiian Spirulina Pacifica - 142g Powder What is the difference between Spirulina and Blue Green Algae? Question about Nutrex Pure Hawaiian Spirulina Pacifica - 142g Powder Is Hawaiian Spirulina superior to other spirulina? Question about Nutrex Pure Hawaiian Spirulina Pacifica - 142g Powder How should I take this? Hawaiian Spirulina, also known as blue green algae, draws nourishment from the world’s cleanest, deepest ocean. No other Spirulina is grown with such a rich source of naturally occurring nutrients.